NITI Aayog CEO, Amitabh Kant on July 14, 2017, pitched for more rapid reforms in India's higher education sector. 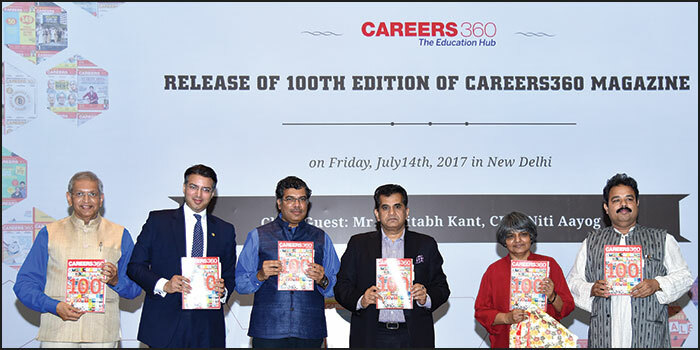 Speaking during an event to mark Careers360 Magazine’s 100th edition release in the higher education domain, Kant said, "We need great reforms in the higher educational sectors. We need to push them rapidly." Kant said the sector is ‘over-regulated and over-governed’. "Higher education is over-regulated and we are working in this regard. We are working to create an easy and simple regulatory framework. We need to expand the higher education sector and for that we need good institutions. Over-regulation needs to be completely scrapped. We should be facilitators instead of being inspectors," he added. Further, he marked that India has grown hugely in higher education sector since independence. "Just look at the dynamism with which it is growing (Top Universities in India), there are over 40, 000 colleges, 12,000 standalone institutions, so we have grown hugely since independence," he said. Kant highlighted that India has attained substantial progress in the higher education sector citing the gross enrolment ratio of India at the time of independence was just 0.4 and its 25 per cent now. He, however, said that India needs to benchmark them against China as both were at the same level in early 1960's, but today Beijing's enrolment ratio is almost 43 percent. He added that Chinese's universities are ranked in top 100 and he does not see any reason as to why India should not have same growth trajectory. “Regulatory framework needs to be shaken up so that we have an integrated system,” he said even as the MHRD, NITI Aayog and the UGC have constituted a committee to look into this. "The outcome would be a 'simple structure' that would oversee the domain," he pointed. He said that many of the problems relating to the sector stemmed from the fact that education was termed as not-for-profit. He said that transparency would be ushered in once changes were made to the policy framework whereby institutions could make decent profit which could be ploughed back to the sector. "There is no such thing called ‘not-for-profit’ as such. The objective should be to generate profit, which could be re-invested," he said. Lamenting the fact that India does not have a single world-class university, the NITI Aayog CEO said, "The Prime Minister himself is taking interest in creating 20 world class universities, 10 each in private and public sector." He further added, "Outstanding universities need to be promoted and government should act like a catalyst." On asked why the GST is harsh on higher education with an 18% tax on Higher Education admissions and fee, he said the institutions failed to make a ‘Huge noise’ on this and promised that the NITI Aayog would look into the matter ‘within two months’. Mahesh Sarma, Editor-in-Chief, Careers360, and the Publisher Maheshwar Peri also spoke on the occasion. The 100th edition release was preceded and succeeded by panel discussions on burning issues related to higher education. Shiv Nadar University's Vice Chancellor Prof. Rupamanjari Ghosh, BML Munjal University's Vice Chancellor Prof. B. Satyanarayana, IMT-Ghaziabad Director Dr. Atish Chattopadhyay, IMI Director General Dr. Debashis Chatterjee, Amity University Chancellor Atul Chauhan, among others participated. Asserting that India has also achieved a lot in terms of higher education system, Kant said many government institutions like IITs, IISc, IIMs have set benchmarks of quality and have been functioning for decades with great quality interest and these have been supplemented by initiatives of private sector. Emphasizing that India was recognized as great center for learning higher education, Kant said private initiatives like Careers360 are playing a very important and significant role. Kant also noted, "Institutions like Careers360 help in increasing citizen awareness; they bring in awareness about higher education institutions which country has, their quality and the information flow. Such institutions bring everything in the public domain and the colleges have to maintain their reputation in the market that is important," he said. Kant also said there are many transformations and changes in the offering for the country which should take India to the next higher level. "We are looking at for instance providing enhanced autonomy to top performing institutions. This should kick start innovation in courses and this should actually push program delivery and help higher institutions to keep pace with rapidly changing technology changing environment," he said. Kant said the NITI Aayog has also deliberated about allowing a many multiple accreditation bodies of global standard to operate within a notified framework.